Babylon Day was observed Sept. 1st, 2002. As it is an internationally celebrated event, it was chosen to mark the inauguration of National Chaldean Museum of Babylonia for Heritage and Visual Arts (NCMB). 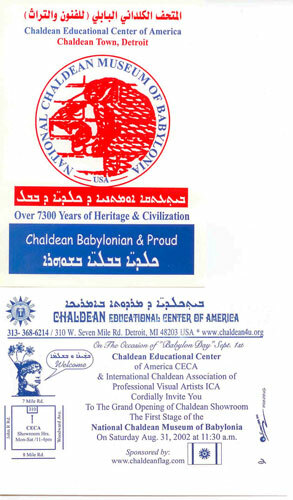 A considerable number of Chaldeans besides American guests and the media attended the function at the Chaldean Educational Center of America (CECA) in Detroit (Chaldean Town). That first stage comprises of three major portions namely: History, Folklore and Modern Arts. 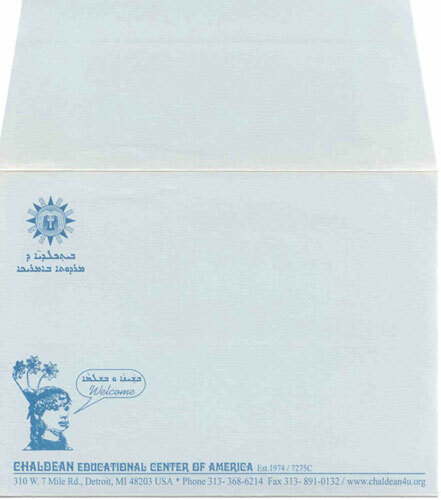 The History collection includes duplicated antiquities (replicas), Historical Sketches, illustrating posters & Charts depicting the national Chaldean history since the sixth Millennium BC up to the Arab occupation era. 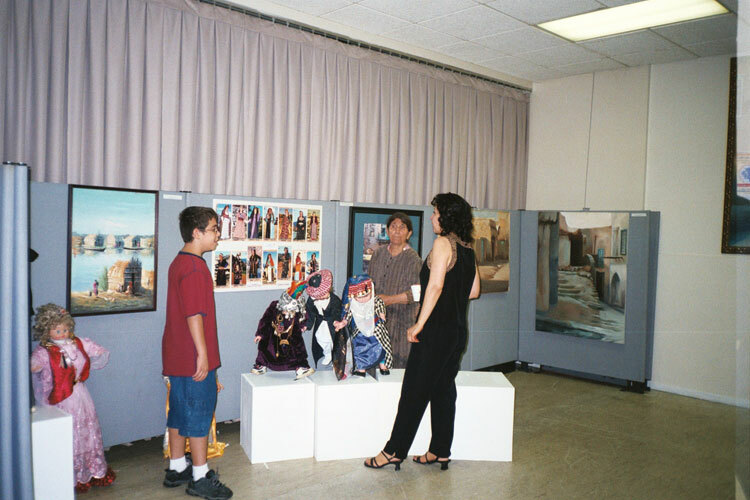 As for the Folk Pavilion, it displays Chaldean villages' costumes, Chaldean architectural manifestations and a diverse array of daily life. Whereas the art works exemplifying academic & modern arts were executed by professional artists F. Yalldo, M. Georgeis, R. Yelda, J. Shamou and the illustrator K. Shallal not to mention the internationally acclaimed Chaldean artist A. H. Fatuhi. Basically, the Museum was brainchild of CECA staff who are presently working on acquiring art or cultural endowments in order to pursue the other stages of the project. To fulfill that goal, the staff has been enriching the museum with history and folk works. Their aspiration is to add other classes, seminars and permanent creative skills workshops for children of age 12-16 in areas of painting, sculpture, ceramics, graphic art and commercial-arts (computer graphic design), these prospective ventures will be offered by CECA professional experts. 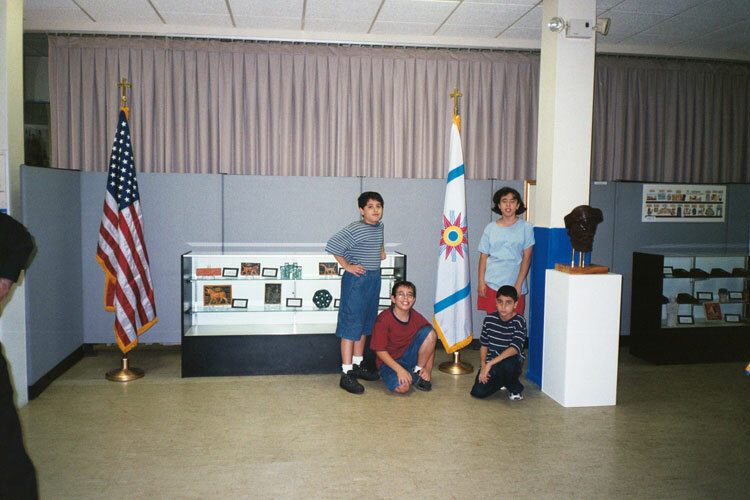 In this matter, we sincerely urge our Chaldean community, of over 200,000 in Metropolitan Detroit to regularly visit the Museum and enroll their children in its free creative skills workshops. We similarly call on all Chaldeans to support the museum in money or donated art works to further its potentialities and promote a more impressive outlook to the museum visitors. 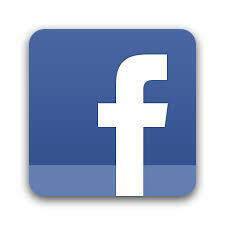 Currently, the museum hours are from 11:00 a.m to 5:00 p.m. every Friday and Saturday. Our aspiration plan is to open the museum all week-long except on Sundays. A six-day operation plan is underway to accomplish the objectives of the museum that are: keeping Children away from street risks and simultaneously training them in productive and entertaining skills. It is worth mentioning that the initiative of establishing the museum was developed in the mind and soul of the scholar artist and historian Amer H. Fatuhi who is renowned for his vast expertise in setting up art galleries and museums. 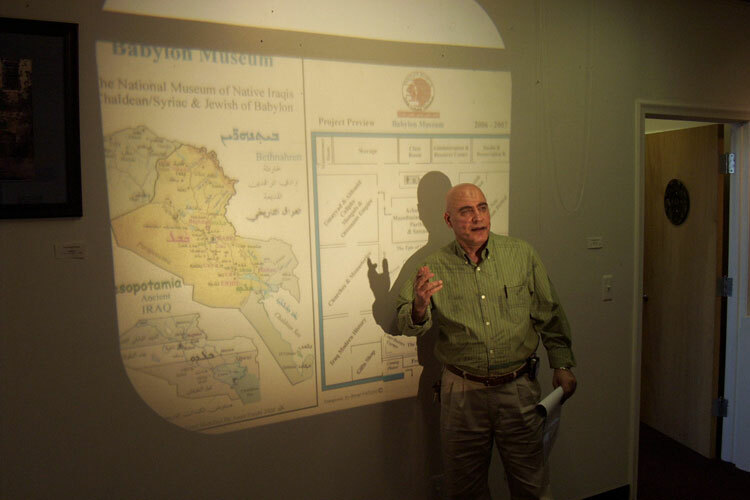 He approached several Chaldean organizations since 1998, yet there was not any positive response or action plan. Until eventually, the International Chaldean Association of Professional Visual Artists (ICA) embraced the project especially its committed executive directors of Art-history as well as the distinguished pioneer artist Issa Hanna Dabish* ICA's Chairman. Through ICA’s support, Fatuhi presented the project to CECA founder Rev. 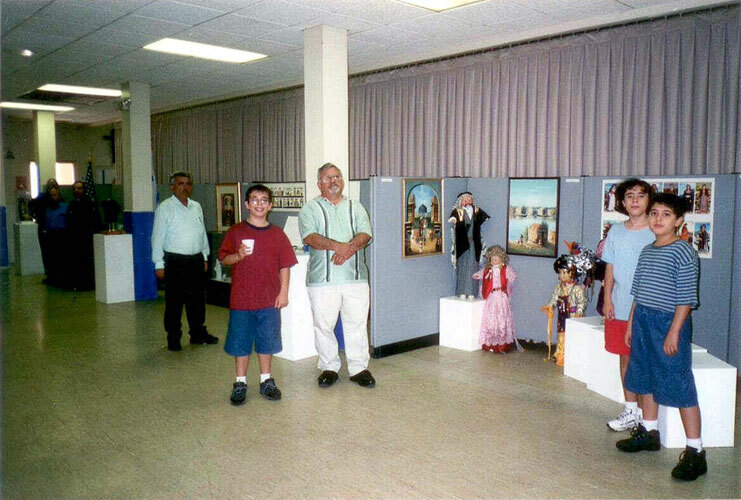 Jacob O. Yasso who instantly became its patron due to the appealing educational and cultural impacts of the project to the whole Chaldeans and in particular Detroit children and youths, and families. The museum staff would like to extend their appreciation to the late pioneer artist Mr. Issa Hanna Dabish ICA’s Honorary Chairman, and Mrs. Jane Shallal, president of the Chaldean Ladies of Charity, for their strong support. 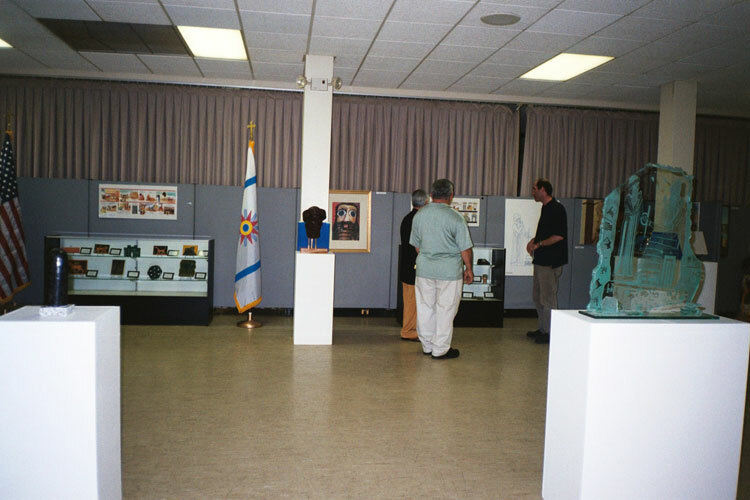 The museum staff would also like to extend their appreciation to the gracious sponsors who, contributed in realizing that outstanding dream to the Chaldeans who pride themselves in their deeply-rooted cultural heritage dating back to over 7300 years. We are all hope that people affiliated with art and cultural organizations will support us to boost this far-reaching educational and cultural landmark. * Issa Hanna Dabish (1919-2009), Iraqi Pioneer Artist, studied art in Iraq 1950 and USA 1951-1955; founder of the first Iraqi modern art group (Friends of art 1941).